Today we will introduce a setup of the jacket style that is rough using individual sentiments! Roughness that is not too overwhelming in a mature set up. 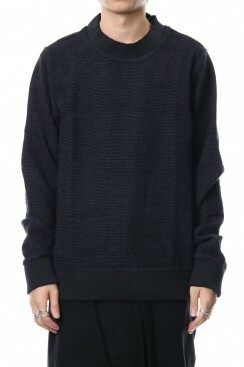 In this style, this rough set-up of pullover sweat and easy pants was made from cloth with a texture of navy black with a deep beautiful shade of nep by individual sentiments, it has an atmosphere that is very vintage-esq with the handwriting pattern. 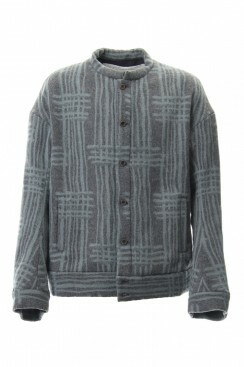 The stand collar jacket was worn as a coat and it is a jacket that is made like a shirt with a drop shoulder. It has an impressive oversize that is very reminiscent of individual sentiments. This fabric made of brushed wool cashmere with beaver finish, it is very soft and has a good touch which does not irritate even those that has sensitive skin! By opening the front, it directs a rougher and rugged atmosphere. It is the main style that has a sense of hep that is brushed with a wintery texture, it has a good impression that has a freshness in the colour with a nice sense of cleanliness with the cool tones of blue and green. If you are interested in giving a sense of unity by using tones and colour schemes, this look has a good finish with a strong styling even with the hat and shoes. 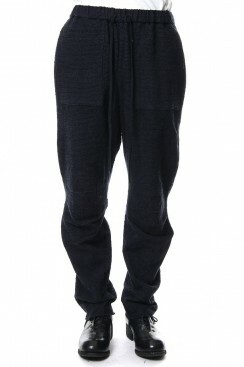 Although the pants are of a full-length easy easy pants at first glance, they are actually three-dimensional around the knees, especially when rolling up and when worn, it creates a unique silhouette. Of course, it is a stretchy fabric as well as the tops, and it is an item with a reputation in terms of ease of movement. Recently it has a mainstream impression with the loose pants and shoes, they look good with long oversized coats as well so please have a look and try on these pants! In winter, the leading piece is usually the outer but we are very particular about the styling of the inners too as you will usually take off your coat indoors! It is an attractive set up with the jacket and pants so we would like you to challenge the stye with rough looks!